WHAT BEGINS as a nearly imperceptible feeling of movement turns, surreptitiously, into a heavy seesawing that wobbles my beer in its glass. The dining room servers, going from smiles to poker faces, move to-and-fro like tightrope walkers in peril. Outside, surly waves the size of box mall stores churn and roil in the mid-day sun as if spoiling for a fight. Had I been on the grid, or made an effort to stay abreast of the news, I would have known that our ship, MV Bella Desgagnés, a 6,550 tonne cargo vessel, had wandered into the wake of Hurricane Igor. The storm was many horizons away and creeping up the Atlantic towards Newfoundland. 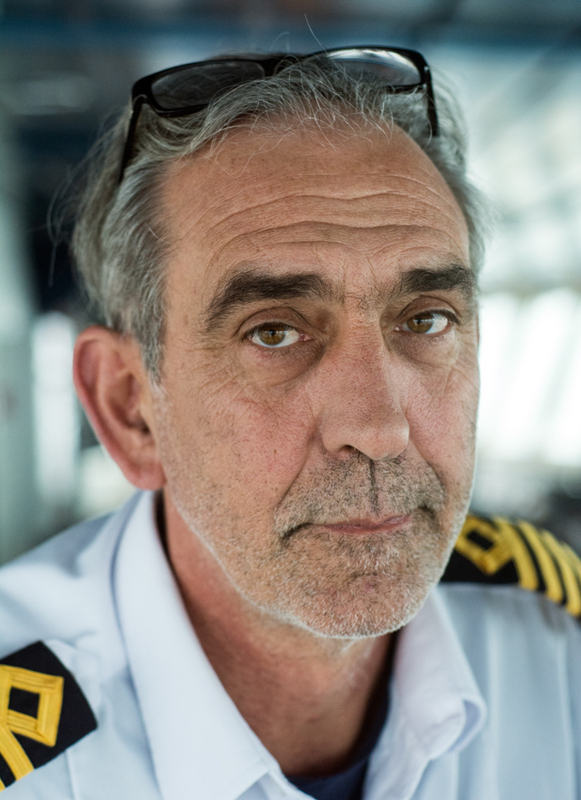 Not until I tour of the ship’s wheelhouse, shortly after, with its glorious three-sided view of boundless ocean, does the ship’s captain break the news to me. My face drops. “Bah, eez nothing,” Hemart Philippe says with suave disdain. The tall and lanky 56 year-old seaman from Shawinigan, Quebec, who wears his captain’s jacket loosely over beige Mark’s slacks and Converse sneakers, tries to assure me we won’t be tossed around like socks in a dryer. “State-of-zee-art stabilizing fins,” he informs me, with a proud grin, arms spread outward like an airplane. He holds his pose and makes a faint whistling sound implying stealth. Suddenly, a huge swell hits the bow. A swimming pool’s worth of spray drenches the windows. We both grab onto a nearby pole to keep our balance. We are travelling in the Gulf of St. Lawrence, heading east along a stretch of Quebec coastline known to locals as Territoire de la Basse-Côte-Nord – the Lower North Shore. For roughly nine months of the year the Bella Desgagnés plods up and down this 425 km route, ferrying residents, supplies and a smattering of travelers, to and from villages that are virtually unknown to the rest of Quebec. The Lower North Shore is the final stretch of coastline beginning where the St. Lawrence River enters Quebec near Montreal. Basse-Côte-Nord officially starts at the town of Sept-Îles, an aluminum and iron ore depot, and runs east and north through a sparsely populated no-man’s-land all the way to the Labrador border. It is a convoluted and far-flung coast – rocky, bleak and often beautiful – where windswept boreal forest meets the first intimations of tundra. It is also a twilight zone of remoteness, an enduring blind spot, whose obscurity is amplified by human neglect – for much of this stretch of coastline has no connecting road to the outside world. That geographical isolation, compounded by economic woes, is turning a once self-sufficient cluster of fishing villages into hollow wilderness outposts. Because of this, the area’s 5,000 or so residents (many English speakers) now refer to their region as “The Forgotten Labrador.” However, a French-speaking Quebecer I meet on the ship’s deck a day later tells me he rejects that title. As we round a rocky archipelago under a turbulent autumn sky, minutes from a barely visible village, he looks at me with that heavy look of suppressed bitterness. SOME 14 VILLAGES lie sprinkled at wide intervals along the Lower North Shore’s vast swath of bristling spruce, muskeg and rock. Though part of Quebec, its proximity to Newfoundland and Labrador make it, to some extent, an English-speaking region. Francophone Quebecers, Acadians and Innu First Nations (the easternmost group of Cree language speakers) also live here. Partly because of a shared destiny defined by geography – and nowadays a common plight – relations between them are cordial. The communities of the Lower North Shore, like those in much of the Maritimes, have always been heavily resource-based. Cod fishing, sealing, whaling, hunting and trapping had been the pillars of life as far back as anyone could remember. The decline of those activities in the 20th century – including the collapse of the Atlantic cod fishery in the 1990s – triggered the start of a slow but gradual diaspora of people from the area that continues to this day. What locals refer to simply as “The Road” (or lack thereof) has become the defining issue on a coast whose youth have been leaving in droves. 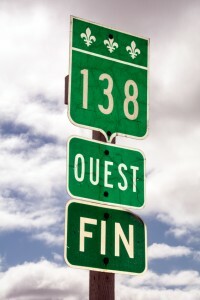 Route 138 is the proper name of the highway that brackets the edges of the Lower North Shore, connecting it to the rest of Quebec and Labrador – but not running through it. Beginning at the New York state border, the highway runs north to Montreal and turns east to follow the entirety of the north shore until ending abruptly at the village of Kegaska – the proverbial end of the line. Then, like a river that mysteriously vanishes underground, Route 138 reappears almost an eternity later at the sleepy village of Old Fort. From there it continues east a short distance to Labrador. For decades, residents of the Lower North Shore have been asking for the two sections of road to be bridged – a gargantuan task estimated to cost Quebec between $600 million and $1 billion. Not only is the region’s economic survival seen as hinging on a road, but also a more tolerable cost of living. Air links, and the lumbering, weekly, Bella Desgagnés, are the only way in and out of the area. Both modes of transport are partly subsidized, but still considered prohibitively expensive. A decade ago, the Quebec government began giving millions to the region in an effort to add sections to the road. But a litany of mismanagement, alleged corruption and bickering between community leaders caused the project to be scrapped. Now, with little optimism that any more government money will come their way, people like Marcoux and others are clinging to one last hope to save the region: attracting visitors. The Lower North Shore’s potent medley of culture, history and intact nature, locals say, could attract enough travellers to alleviate their isolation, bring in some money and save their villages from an extinction that hangs over them like a sword. TWO DAYS AFTER boarding the Bella Desgagnés in Sept-Îles, I arrive in the English-speaking community of St. Augustine – a fishing town of 400 souls that has seen its population dwindle by half in recent years. It is situated in hilly boreal wilderness on the banks of the St. Augustine River, at whose mouth downstream lies an archipelago of hundreds of moss-encrusted islets peppered with colorful fishing shacks. 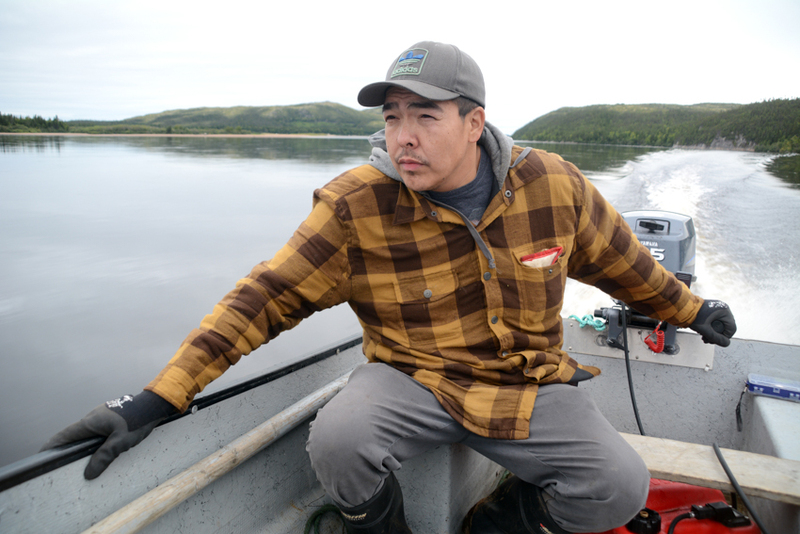 Directly across the river from the village sits Pakua Shipi, an Innu First Nation reserve. A boat connects the two villages. I take a room at Pension de la Côte: a self-styled bed and breakfast in the home of a retired lobster fisherman. I use his place as a base to explore the town, no more than a smattering of homes interspersed along winding streets. The marina and a small grocery store is the town centre. There, I find a circle of older men in baseball caps sitting on their ATVs having a lively chat. To say that the English spoken here is heavily accented is misleading. It is a thick dialect bordering on another language, spoken rapid-fire and influenced by French. It is as unintelligible to me, a Torontonian, as the English spoken in the Orkney Islands in Scotland. Luckily, communicating turns out not to be a problem. When I introduce myself to a round of leathery handshakes, the men automatically speak slower and more clearly. The first question I get (which everyone will ask me on this trip) is: “Will you be writing about ‘The Road?’” The second question, just as frequent, but somewhat more unexpected is: “Why are you here – now?” Autumn, they tell me, is moose hunting season. It is a cold and rainy time when the village goes extra quiet. “What were ya thinkin’ booy?” one of them says. “Ya shoulda come dooorin’ skidoo season! Dat’s when it’s hoppin’.” The others laugh and nod in unison. In winter, the Lower North Shore’s road woes vanish as residents and outsiders are able travel overland by snowmobile – along tracks in the snow known as “Route Blanche”. In a season when much of Canada hibernates, people here come out of their shells. The major highlight is weekend hockey tournaments between towns, which attract people from up down and down the coast. Those matches often culminate in carnivals and long Dionysian beer parties that stretch into early hours of the morning. After hearing their stories and exploring the town, I cross the river and visit to the French-speaking Innu First Nation community of Pakua Shipi. There I meet Mathias Mark, a tall and heavyset 34 year-old who runs the community’s only lodgings: the Auberge Innue de Pakua Shipi. It is a multi-room bungalow turned into a bed-and-breakfast. When I tell Mathias that I’m interested in exploring the wilderness, he offers to take me up the St. Augustine in his punt. A day later we are heading up the wide, shallow river, on whose shores sit small mountains carpeted with birches and spruce. The brooding autumn sky accentuates the boreal bleakness, giving the wilderness a palpably lonely feel. We are in the same stretch of woods – reaching into Labrador – where some pioneering canoe expeditions took place in the early 20th century. Those real life adventures, immortalized in James Davidson and John Rugge’s book Great Heart: The History of a Labrador Adventure, unfolded in a similarly thick and unforgiving wilderness. Though lacking formidable barriers of mountains, travel through this vast stretch of spongy, boggy wilderness is slow-going and sees some of the worst summer bug infestation on the planet. 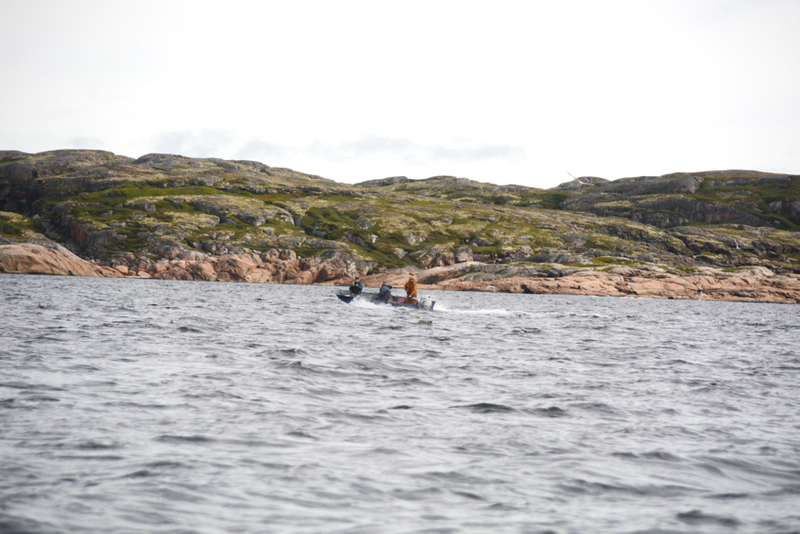 We stop to drift and cast fishing rods that Mathias brought, hoping to catch some small sea trout. My host, who sees himself as an adventure guide in-the-making for his community, tells me he would like to one day be able to take visitors on deep wilderness trips here. In the evening, Mathias takes me to his family’s ceremonial tent – a traditional Innu enclosure made of a white canvas tarp spread over a birch frame and filled with spruce boughs. We spend the evening, during a cold downpour, with his grandfather and cousin, sitting by the wood stove eating a kind of caribou risotto made by his grandmother. His grandfather, an elderly and weather worn man, sings stories about the area’s legendary caribou herds, which the Innu believe created the world. All this, as our shadows cast by candlelight, dance like vivified spirits on the tarp behind us. IF ST. AUGUSTINE and Pakua Shipi provide a taste of the Lower North Shore’s deep isolation, the area around, and including the community of Blanc-Sablon, further up the coast, tell you what greater connection to the outside world looks and feels like. For one thing, the mixed French-English region has a road. Here Route 138 rematerializes after its interminable disappearing act. The road seems to literally come out of the water at the marina in Old Fort and winds its way, some 69 kilometres through gorgeous coastal mountainscapes, to the Labrador border, beside where Blanc-Sablon is perched. There on the frontier, at the foot of a monstrous three-story sign and flags welcoming drivers to “The Big Country”, Route 138 quietly surrenders itself to the equally paved, but more frequently potholed, Highway 510. Blanc-Sablon sees a lot more visitors than its sibling communities to the west. 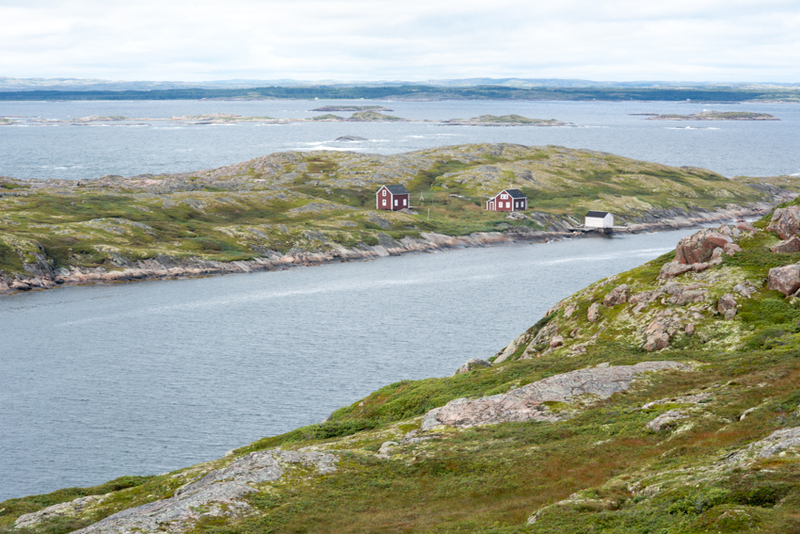 In addition to the road, the town offers Canada’s only mainland ferry to-and-from the island of Newfoundland. 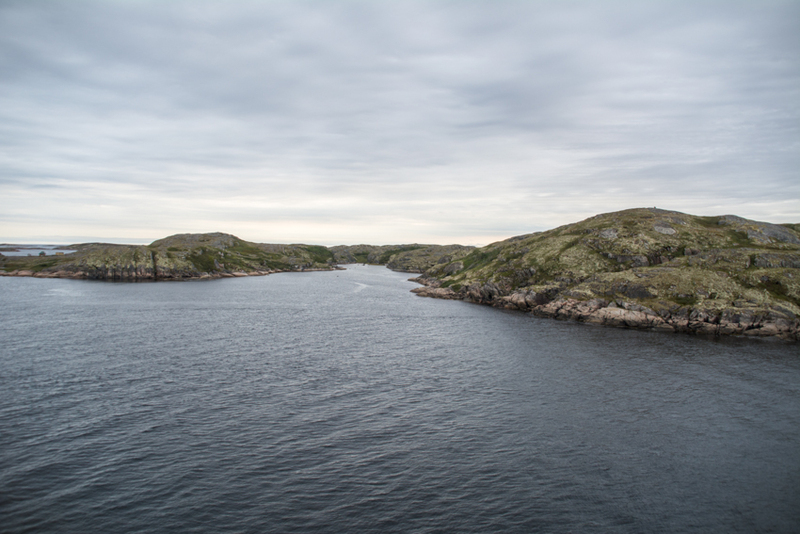 Road trippers use the ferry to get from Labrador to Newfoundland – and vice versa – and have to pass through Blanc-Sablon to do so. With the completion of the Trans-Labrador Highway in 2010, creating an overland corridor through the interior of Quebec to the St. Lawrence River, the number of visitors passing through Blanc Sablon has tripled. A few small hotels and restaurants are surviving from the meager, but consistent business. Even with tourism dollars skimmed off road trippers in transit, the area remains moribund most of the year. 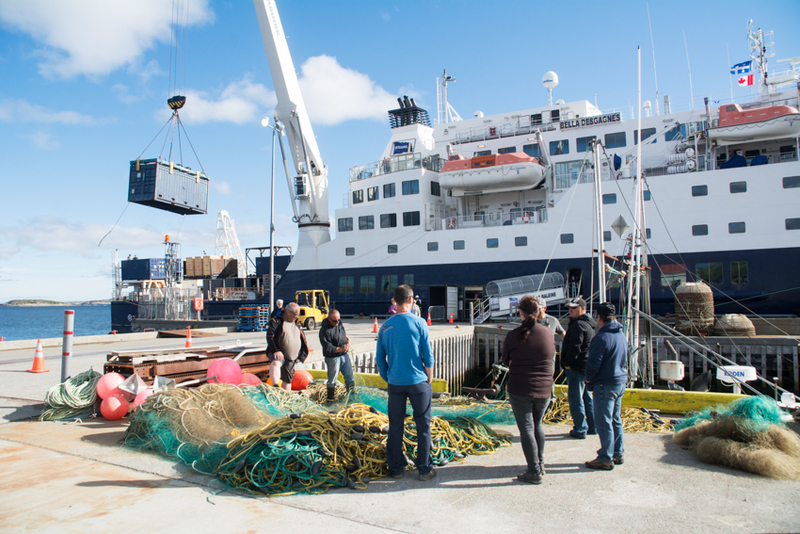 Blanc-Sablon, like its neighbours, was a fishing economy that suffered the same setbacks over the decades. 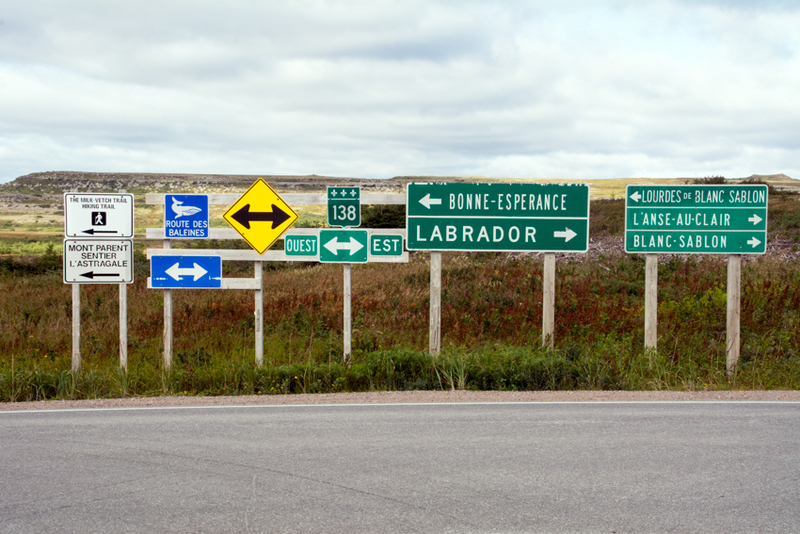 In 2014, the town’s mayor even tried – unsuccessfully – to secede from Quebec and join Labrador. But with Blanc-Sablon’s population stabilized at over 1,100, and with its circuitous links to the outside world, there is cautious optimism that the town won’t vanish outright – and might even grow. In cooperation with VoyagesCoste, Jones organizes daytrips for visitors stopping on the Bella Desgagnés. He’s also helped to create hiking trails, whale watching trips and kayaking excursions to view icebergs and a seasonal colony of pelicans – activities in the spring and summer months. He tells me, over and over with an almost evangelical optimism flecked with anger that he’s convinced visitors would flock here if the remaining part of Route 138 were completed. Taking Jones’s advice, I rent a vehicle and spend the next few days driving up and down the short stretch of Route 138 between Old Fort and Labrador, stopping to take in panoramic views of seaside archipelagos and the mysterious boreal landscapes with saturated Earth tones that beckon into the interior. The magnificence of the land is measured, understated and far from grandiose. But it is tinged with some indescribable drama reminiscent of Iceland’s otherworldliness. And it remains tucked away, hidden, forgotten. HAVING SEEN HIGHWAY 138’s dead-end at Old Fort, I am determined to visit the other. During the return to trip to Sept-Îles on the Bella Desgagnés I get off at the village of Kegaska – an Innu First Nation crab fishing community where the official population, coincidentally, is 138. It is here that the highway, travelling more than 1,400 km from Quebec’s border with New York State ends with almost zero fanfare at the water. It is dusk when I disembark and I manage to catch a lift to the highway’s official terminus, where, so many road trippers, thinking it continues all the way up the coast to Labrador, find their journeys scuttled. There I discover a marked highway sign inscribed by the numbers 138 and the French word “Fin” (The End). As I stand there, I picture in my mind’s eye the unattached ends of the road, reaching for each other. I think of Leonardo Da Vinci’s famous Sistine Chapel painting, where God and man, arms outstretched, fingers almost touching, try and make contact with each other. For residents here, the gap, the distance between the two ends of the road is symbolically just as great – and no less important. This article ran in the Spring 2016 issue of Explore magazine.